The first draft of this article was written in 2003. My own (Ken's) sub-standard digital photos didn't do much to promote the article and it went unpublished a couple of years while revisions were made to both the article and the layout. 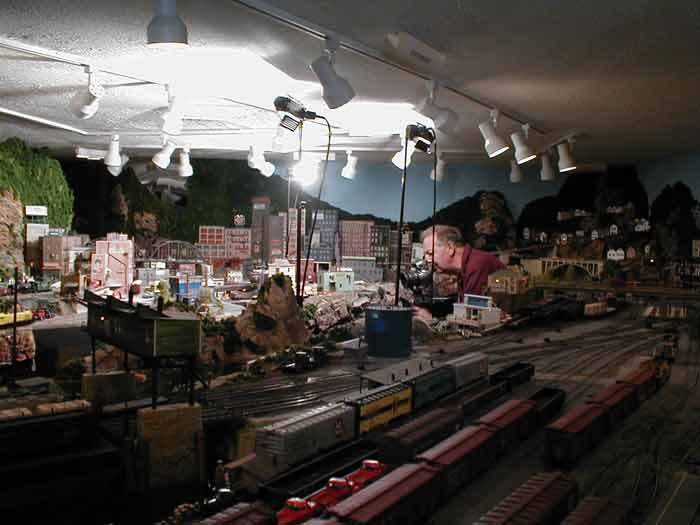 In early 2005 the NMRA Convention Staff for Independence Junction 2006 took pictures for evaluation of HP&H as candidate for the convention layout tours. Val Pistilli took some great shots and these led to Model Railroader's interest in the HP&H layout to promote the convention. Later in 2005 Paul Dolkos shot a pile of fabulous pictures and updated the article. Oddly only one of Paul's photos made publication before the convention (Trackside Photos July[?] 2006). Without a convention to promote, and as the months rolled by, the article was presumed dead. In March 2007, to my surprise, Dana Kawala at MR contacted me about clarifications in the article and track plans. Following a flurry of activities, six pages of text and photos made the July issue of Model Railroader. The article is largely correct as published although there are four loops at each end, not two and I now have four grand children, vice three. So, time has passed between inception and publication and life goes on. Besides the fourth grand child, I have more gray hair than shown in the photo and I'm tearing down the layout for a fresh start. Why? For answers see the new Hudson Point & Hawthorne.